View BX style split bearing bushes and glacier style bearing bushes. BX bushes are used in pneumatic equipment, medical equipment, textile machinery, agricultural equipment, scientific equipment and so on. 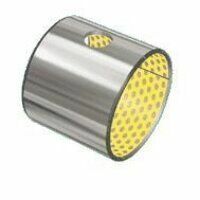 They can also be used in the automotive industry for power steering, pedal bushes, seat slides and so on. Buy all your split bearing bushes online here for a fast UK delivery. All bearing bushes are in stock & ready for same day dispatch.